"We’re announcing a new database, Suffolk County, MA: Probate File Papers. This database was created from digital images and index contributed to NEHGS by the Massachusetts Supreme Judicial Court Archives. It contains the records of 21,387 Suffolk County probate cases filed between 1630 and 1800. The probate cases include wills, guardianships, administrations, and various other types of probate records. The cases range in length from one to over 350 pages, with a total of over 191,600 individual file papers. The complete Suffolk County File Papers collection will eventually cover cases 1-94,757, which includes years up to 1893. The cases are indexed chronologically, which allows us to present them in sections while digital photography is taking place. The digital photography is expected to continue through 2020. We will continue to add additional cases as they become available." Note that this collection is digitized images of the actual probate papers that were gathered into probate packets by the Suffolk County, Massachusetts Probate Court, and not the Probate Court clerks transcription of the papers entered into the court clerk volumes which are on FamilySearch (unindexed) and Ancestry.com (poorly indexed). 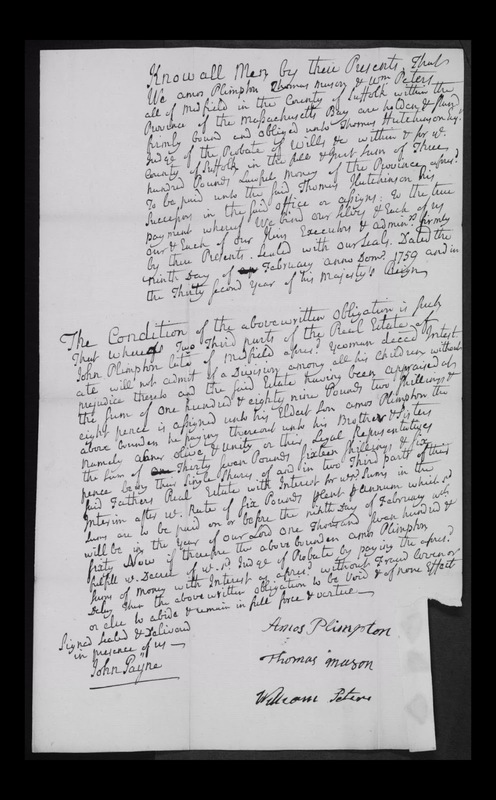 I stated today in my blog post (Amanuensis Monday - Probate Records for Estate of John Plimpton (1708-1756) of Medfield, Mass. - Part 4) that I had not found a certain record that distributed the two-thirds of the real estate which would go to the four children of John Plimpton by law. Very cool! It even has the actual signature of my 5th great-grandfather, Amos Plimpton!! I will transcribe it in an upcoming Amanuensis Monday post. It will have to be Part 3 and a half in the order of the papers. 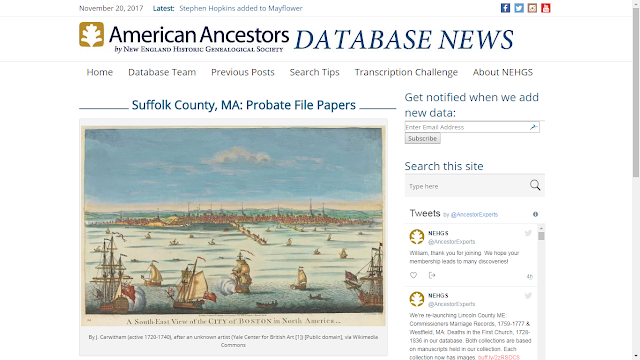 Now I can use this American Ancestors database for Suffolk County rather than go through the Probate Estate Index and Probate Docket pages on FamilySearch digital microfilm. Disclosure: I am a paid member of NEHGS since 1994, and use their digital resources frequently. They are indispensable for New England researchers.